mung bean paste, GREEN agar strips, and RED beans. It looks and taste pretty similar to Suong Sa Hot Luu but there are some differences. We use red beans in Che Ba Mau and a different type of agar. Suong Sa Hot Luu uses a grass jelly agar which has a really distinct grassy taste and a dirty pondgreen color. 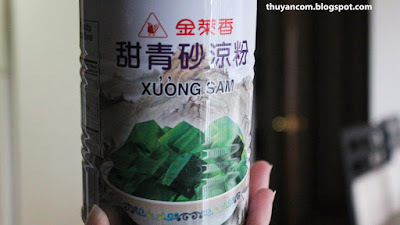 You can make your own agar strips but to save time I just buy a can of agar called Suong Sam, it's lime green in color and has a lighter taste than grass jelly. Finally we usually sweeten Che Ba Mau with condense milk. I like faux pomegranate seeds so I like to include it in my Che Ba Mau as well. I have to admit Che Ba Mau is pretty time consuming and tricky to make. Making the red beans and mung beans can be a nightmare. You have to cook it on really low heat over a long period of time. I've burned quite a few batch over the years. I recommend soaking the mung beans and red beans overnight. 1. Rinse the red beans in water until the beans no longer makes the water cloudy. 2. Boil 5 cups of water in a pot and throw in a medium size rock sugar. Drain the red beans and pour into pot. Cook the red beans on low heat for around 2 hours or so. Once tender, drain and set aside for later. 3. Prepare the mung bean paste (refer to my Suong Sa Hot Luu entry for cooking instruction). 5. Slice the Suong Sam agar into strips. 6. Heat a can of coconut milk in a small pot and add 2 tablespoon of sugar. Once the sugar has dissolved, let cook for later use. 7. Prepare the crushed ice. 8. In a bowl, spread some mung bean paste at the bottom of the bowl. Second add agar strips, next the red beans, and then the faux pomegranate seeds. You can prepare these bowls ahead of time and store in fridge. 9. 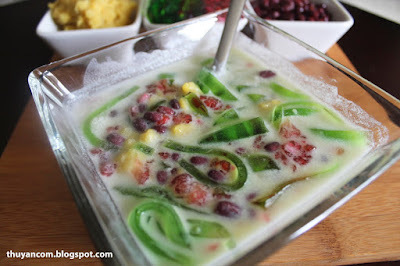 Before serving, add the condense milk to the bowl and then top off with some crushed ice. Finally drizzle the condense milk at the very end, depends on how sweet you like it add as much as you like. Honestly I was about to give up on my pot of beans today and run to the store to grab a can of beans. But it's really hot out so I actually waited for it to become tender. You should try this recipe with canned beans, i'm sure it won't make a big difference. The mung beans isn't so bad if you let it soak over night. Good luck! 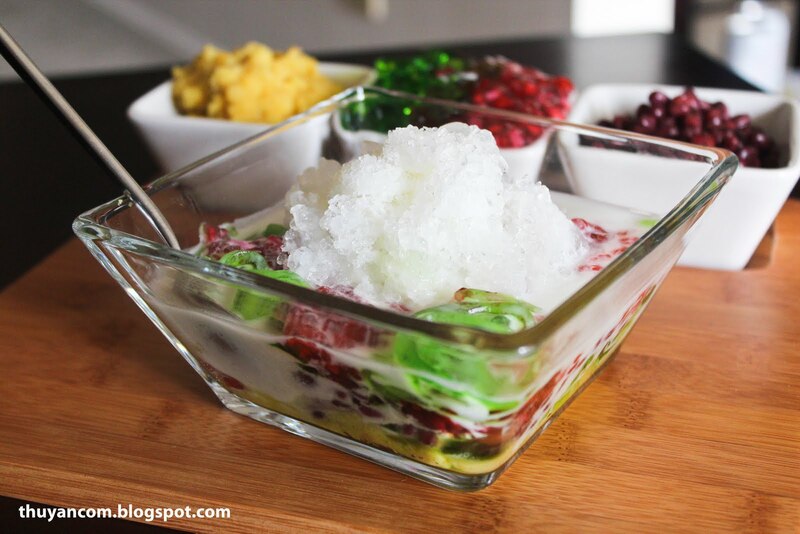 Great refreshing bowl for the scorching hot summer at the moment in Korea. Boil them with ONLY water, briskly or not is fine. Sugar or salt can multiply the length of cooking by 3-30 times. Just add the sugar/salt after it's done. I forgot to mention this one important thing. I like that you used crushed roasted peanuts to top it off. What flavor! love the new look! very easy on the eyes! WOW! Nice delicious food items. Can any leftover mung bean paste and red beans be frozen for future use? I'm not sure about the mung beans but the red bean would make a great dessert by itself with water and sugar. I have just tried this desert for the first time and it was AMAZING! I will definitely be trying to make it at home, I am glad I found a recipe for it! i love eating che ba mau! id eat it all the time during the summer, its just so refreshing! but i cant help thinking...what is the history behind this dessert?